I was sketching desserts and jotting down recipe notes the other night when I asked B. if he had any more suggestions for the box of Meyer lemons we had in the fridge. A whole box! Thanks to my dear Mary of Alpine Berry I am now host to a whole crisper full of gorgeous homegrown Meyer lemons from her tree. I had just finished churning lemon ice cream and lemon sorbet but his eyes lit up and he exclaimed "Lemon Limoncello Cupcakes, please!" To which I reply "Sacre bleu! You want me to turn zee oven on?!". But he'd been really fantastic with these lemons that I had to cave and make him cupcakes. The lemons arrived while I was visiting Veronica (I will put a page up soon on how to get your own Pastry Bootcamp) and I had completely forgotten to warn him. When I finally remembered, some of them were already showing a sad face. You'd never believe what my man did: he washed each and everyone of them, dried them, segmented the ones that were going bad, saved the good parts, placed the others in the crisper by order of ripeness, the sad ones toward the front, the happy ones in the back. Now you have to understand that this was coming from a guy who does not bake or cook, rarely steps foot in the kitchen unless he is on dishes duty. Bless his heart! You rock Bill!! So, you can imagine that when he asked for cupcakes, I could not say no even though they are not part of my usual baking repertoire. It's a French quirk nothing more. The addition of my homemade Limoncello is purely because we have been enjoying remembering family stories while sipping on the liquor. The more we sip, the more details we seem to remember about a particular afternoon spent with my uncle Jacques one winter. If you have ever had homemade moonshine, this will sound all too familiar, if not, well, give it a try. You'll have something funny to tell your kids. Whenever we go home to France to visit my family, we have to do "the rounds". Lots of uncles, aunts and cousins inviting us to lunch or dinner around a lot of food, good wine, tons of stories and an obligatory after dinner "digestif" (an alcoholic sip to help with your disgestion). A nice sip of cognac or Grand Marnier alongside a steaming espresso. Over the years, Bill has become very fond of this tradition and was looking forward to the much talked about "Jacques' moonshine". After lunch, my uncle prepped coffee and pulled out from the liquor cabinet a bottle of Perrier, popped it open and set it in front us. Bill looked surprised until a waft of it came to tickle his nose. This was no Perrier alright! We drank our espresso and my uncle leaned towards Bill to fill his cup with moonshine. B. got concerned that there was still a small stain from the espresso at the bottom and asked if it would not be best to wash it out first. We *all* looked at him and giggled. Jacques, in his usual prankster's way, told Bill to look very closely while he poured. At the first drop, all remaining coffee stains disappeared. "See, just like bleach!". Bill got this extremely worried look on his face and I knew exactly what he was thinking "Oh dear God, these Frenchies are trying to kill me!" We all raised our cups, toasted the newcomer to the family and drank our moonshine straight. Silence followed. Then Bill coughed and exclaimed "works your intestines like bleach would too!" to which we replied "well yes, that's our interpretation of digestif!". When we first had a taste of the Limoncello I made, we both squinted and remembered the day my uncle tried to bleach Bill's stomach with homemade moonshine. I had made it very very strong. But what can you expect when the recipe came straight from an Italian boat captain shoving a bottle of his own 180 proof alcohol in my basket?! Ha! Good thing I had planned to dilute it with lemon juice and more sugar! Still...way way strong to be sipped easily so I have used it as a soaking syrup for cakes a great deal and made us a little tipsy on more than one occasion! These cupcakes are clearly on the adult side with Limoncello in the batter and cream cheese frosting. I do make an unconventional lemon curd as I don't use a whole lot of eggs and no butter. This one was on the (very) tart side with a lot less sugar than most recipes call for. I love a good Swiss or Italian meringue buttercream on my cakes but since they were per Bill's request, I went with his favorite, cream cheese frosting with Meyer lemon zest and liquor. I topped each one with redcurrants because we love to eat them fresh. Tart on tart! Now that's my kind of Happy Hour! One year ago: Maple Cardamom Mousse and Strawberry Tarts. In the bowl of an electric mixer fitted with the paddle attachment, beat the butter, cream cheese and sugar at medium speed until light and creamy, about 2-3 minutes. Add the eggs, one at a time, beating well after each addition. Add the limoncello and beat an extra minute. In a medium bowl, combine the flour, baking powder, and salt. Add flour mixture and buttermilk alternatively to the butter/eggs mixture, beginning and ending with flour mixture. Add the lemonjuice and zest. Fill cupcake tins 2/3 full. Bake for 20 minutes or until a toothpick inserted near the middle comes out clean. Let cool completely. In a heavy medium saucepan, stir together the lemon zest, juice and sugar and bring to a simmer over medium heat. In a small bowl, beat the egg and egg yolk to break them up. Beat some of the lemon mixture into the eggs to temper. Scrape the mixture back into the saucepan and cook stirring constantly until it thickens up, about 5 minutes. Remove the curd from the heat, let cool completely. Notes: I recently found out that the newest Wilton nut cups I previously used for baking cupcakes had been changed and now came with a warning that the new coating was not fit for baking. I baked one batch with the cupcake liners lined with parchment paper inside and one set without. I also put an empty liner in the oven to see what the coating would do. Nothing happened to the coating in all three experiments but use your own judgement/preference as far as liners go. I've *smelled* moonshine, but I've never actually tasted it. Sad considering I hail from the original Nascar state, which of course started because of Moonshine. But I'm afraid it might burn a hole in my tummy! Gorgeous cupcakes! Bill is one lucky duck. Wow! Your hubby showed so much amazing care w/ the lemons - washing them, cutting off the bad parts and then sorting the lemons for you. Your hubby is a total keeper! PS: Sorry about the ones that went bad. Now I know why meyers cannot be found in some parts of the country. Ripe ones cannot survive the shipping. Wow these look great Thank You for sharing. Ohhhh, this looks and sounds so refreshingly delish! I'm thinking this would be the perfect little ending to a little outdoor gathering with some neighbors! Thank you for the lovely idea! I am sorry I have not visited in so long. I have missed your work. This cupcake is literally "off the charts". When you consider the all the rage in cupcakes right now, I think you have taken this to a whole new level. Every time you talk about lemons I remember I have to tell you about the obsession with citrus in my family (which is of course something that comes from being Persian). If there were a stupid comedy to be written about us, it would probably be called Tart and Tarter. Have you ever had Marc de Bourgogne? Man that stuff will put hair on your chest, but it is good stuff, this coming from a total featherweight where alcohol is concerned. Limoncello is probably my favorite digestif because.. the lemons, I heart them. B couldn't have picked a better choice than this cupcake recipe. Delicious and lovely altogether. I wouldn't mind "tart with tart" for sure if I was having some of these. I have yet got my hands on myer lemons yet. I wish I could. Your cupcakes are so beautiful. These are my type of cakes. Simple (no colorful icing) but tasty! That was nice of Bill! Wow, lovely cupcakes there. I always love your baking and pictures. I've a creative blogger award for you, please check out my blog for the details. Cheers! This is the kind of reward I'd like people to treat me with! Sigh, one can hope... ;) Beautiful, as always! what wonderful memories of your family--it is very like my husbands italian family and their digestifs. I love the way your photos turn out! Its awesome! Love every post of yours! Very pretty! I would love to hear about the ice cream - I made a Meyer lemon ice cream once and it was one of the best I ever tasted! 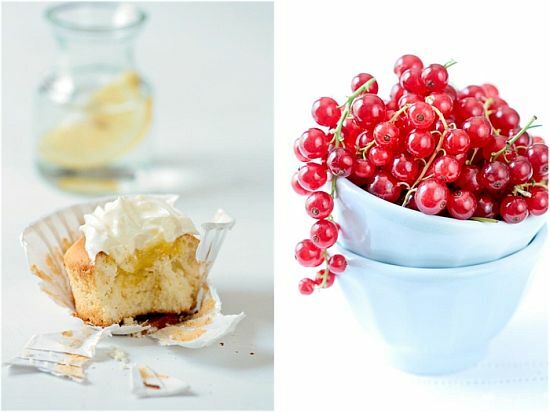 I like the sound of lemon and red currant, too. And what a great guy Bill is for sorting the precious lemons as well. Your post made me laugh so much !!! 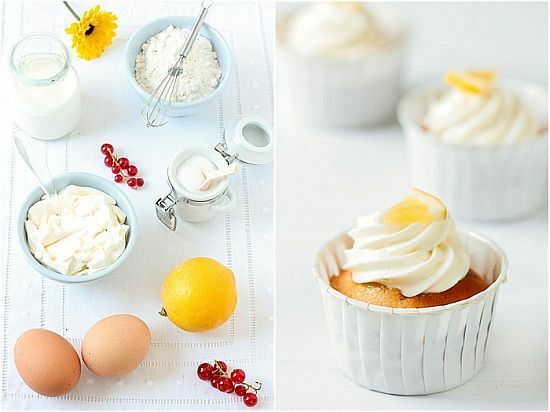 I pictured B. among you family with the moonshine :o) And although you don't usually bake cupcakes, these look very good and are surely delicious with the limoncello ! Your photos--let alone your food creations--are absolutely exquisite. I am more impressed each and every time I visit your site. Oh my! I'm very jealous of you having all those Meyer lemons! My brother has a tree in his yard in California. Wish I could keep my house but live there! I have a recipe somewhere for grapefruit-cello somewhere that I've longed to try. This is further inspiration to make moonshine. What a great looking cupcake!!! I'm planning on my making my own limoncello in a few weeks so these cupcakes would be great to make. Would you consider posting your recipe for homemade lemoncello? I looked all over your site but you hadn't posted it before. Mary: only 4-5 went very ripe duroing the shipping so not a big loss and Bill got plenty of segments by cutting in them! Gabriela: I wish I could but it is Sergio's family secret recipe. I will try to Google a recipe for it that comes as close as his. J: I am plain Jane so the honor is all mine! 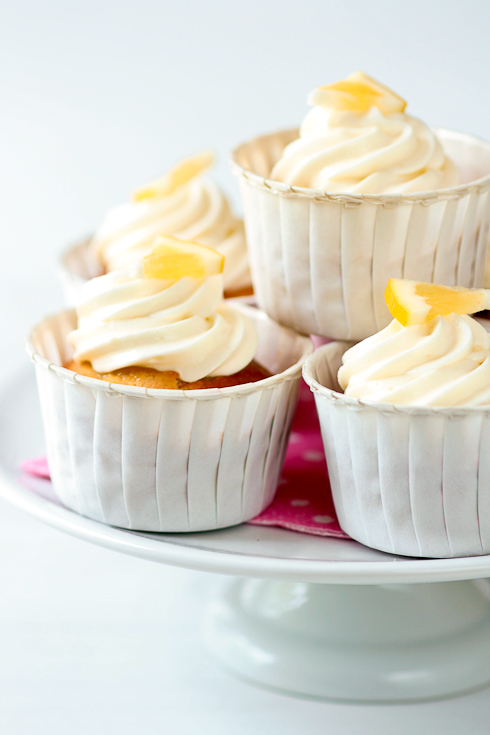 See I just love lemons and these lemony cupcakes... well, what more can I say but fantastic! I really think your husband deserved these cupcakes! But if I could eat one I would have done the same thing to your lemons!!! 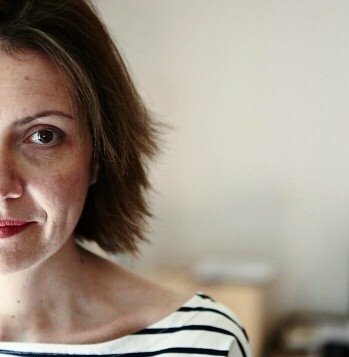 I have been reading your blog for some time now and love it! You are so clever! What i would like to ask is what is so special about Meyer lemons? Are they bigger or is the flavour different to ordinary lemons? I 'm from the UK so have only recently come across mention of this type of lemon. Anonymous: this article in Wikipedia should explain why they are so loved. My Grandfather use to run shine during prohibition. (Shhh, dont tell anyone). This recipe is just gorgeous! Anything lemon is good, but anything with limoncello is better. Beautiful as always. Just thinking about Limoncello makes my lips pucker. Your story is so sweet- or should I say, tart? Gorgeous photos- as always, tres belle! I hope to get quite a few lemons off my Meyer and Eureka lemon trees - but I'll have to wait a few years for that - can't wait to try these (may have to go to the shops and buy some lemons as I don't think I can wait). These cupcakes look so delicious! I will defintely need to try this recipe. Oh, and where did you get those little milk bottles from? They're cute. I had to laugh when I read your post. I made a huge jug of limoncello last year and gave out half bottles of the finished stuff at Christmas and then just sat back and waited for the stories to trickle in. One coworker lost a whole weekend, and came in on Monday asking for more :) I am working on another jug now for the holidays, but I'm sure I could steal a bit from it for this recipe, especially since I have several pints of freshly picked currants in my fridge. Thank you for sharing! Happy hour indeed. It seems Helen that your stories, sad and happy, all ways make me feel you are loving life and make me feel good inside. No doubt the homemade limoncello and these cupcakes would have the same effect. These look lovely - and as always, I am a sucker for anything containing citrus. Mmmmmmmmm. Mmmmmmmmmm. Mmmmmmmm. 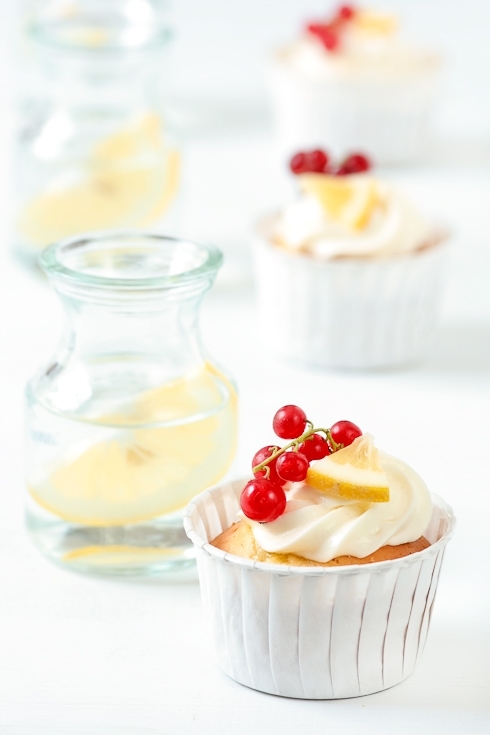 I love lemons and cupcakes and these limoncello ones must be delicious. Okay, I can't imagine any man I've met in my life - or even any of my girl friends, or family members - washing and sorting lemons for me in my absence. What a hero, heh. At this point I'd like to put my hand up and volunteer to clean & sort your entire kitchen if limoncello cupcakes are in the offing. Please? Your hubby indeed rocks for caring for the lemons while you were away! What a sweetie! kind & wonderfully sweet wishes! Bill certainly had an amazing idea, Helen - not to mention the he was a great helper! These cupcakes are right up my alley - can't resist anything lemon! Oh my! Everything about these sounds wonderful. Meyer lemons are one of my favorite things and combined with limoncello- perfect! The cupcakes look amazing--cream cheese and lemon: Yum! So how do you make the limoncello? I am in the process of making homemade sour cherry brandy. I printed out the recipe immediately. I adore limoncello anyway- I serve it often drizzled over fruit and then top with yogurt mixed with lemon curd. So I know I will love these cupcakes! I have never made anything with limoncello but I have heard of it's legend. Your cupcakes look so pretty and I don't mind getting tipsy a little bit while eating them! I'm glad you made B. some cupcakes, it was so sweet of him to take care of that box of precious meyer lemons! These look delicious. I know I'm always looking for something to do with my meyers when my little tree ripens. Great photos too! they look so exciting for being so little! Beautiful. I really want to try these, thanks for sharing. Limoncello, smells amazing, I can just imagine how tasty those cupcakes are. These are gorgeous! And they sound delicious, beautiful as always. I love your blog and read it regularly. Any chance you would post your recipe for homemade limoncello. It's a favorite of mine and I'd love to try your recipe. Laura and Anonymous: I updated the recipe with two possible recipes for Limoncello. I only make Sergio's and I still have tons of it so no plan to make another batch in the near future. Meyer Lemon Limoncello Cupcakes, dit moi qui est la plus belle? Looking at these are almost enough for me...love your photography! Meyer lemon + baked goods = heaven for me! Nice cupcakes! You should also try these meyer lemon ricotta cookies. What kind of berries are those in the picture? I'm 100% with Bill - cream cheese frosting, limoncello, and ze Frenchies, they're trying to kill us all! :P Beautiful cupcakes, they're just wonderfully bright. Just what I needed to see. How intriguing! What a creative and inventive idea. They look refreshing...but like they pack a punch! Where are Meyers ripe right now? Mine ripen in December. I've never known anyone in the Northern Hemisphere to have ripe ones in July! This pregnancy I haven't wanted to eat much. However, your mention of lemons hit the spot for me. I like to eat them sliced with salt. Just thinking of it makes my mouth water. I think I'll go slice one! The Prudent Homemaker: my friend Mary who sent me the lemonds lives in San Francisco and just got them off her tree less than two weeks ago. I'm truly drooling excessively over this one. This is my kind of recipe :) Where on earth do you find these cute cups that you use as cupcake wrappers? Lovely looking cupcakes Helen! I'm so jealous you get Meyer lemons, I've never had them. Great story to go with it as well. I know what you mean by doing the rounds; whenever we go to Belgium that's all we seem to do. But we've wisened up a bit, these days we usually invite the whole family around to my parents', so we get to see everyone in one go and can spend the rest of our time shopping for chocolate and beer! bonnie-ann black: did not have a moisture issue when I make them and I was wondering if it could have come from the weighing of the flour? Did you spoon the flour in the measuring cups and leveled it off or did you scooped and leveled? I don't see why cake flour would not work here although I can't vouch for it (haven't tried it with those). You can also bump up the buttermilk a bit. If you mean that the lemon curd was not tart enough, you can cetainly decrease the sugar content by 2 Tb and see if that works better for you. thanks, tartlette: i did the scoop and scrape, then sift, then spoon and scrape... the batter was certainly light and fluffy enough to float away. perhaps i was thinking the cake would be more of a chiffon-y texture. the lemon curd was just fine, as was the icing. i was just thinking the cake should be more lemony. maybe cut the buttermilk by a tablespoon and up the lemon juice by a tablespoon? what do you think? Is it possible to buy limoncello instead of making it? June: by all means! Any liquor store carries Limoncello these days. Parfait! rien à dire de plus!! 1. Where did you get these cupcake liners? They look so much "sturdier" than the basic cupcake liner. 2. How do you not get your cupcakes to look "burnt" around the cupcake liner? Mine always leave oil marks on the bottom and look extremely unappealing. Samantha: these are actually nut cups from Wilton, they have been re-labeled since then as they are not suitable for baking - there is a plastic lining inside. The older version was food grade safe if you can find it. For your other question: it's nothing I do but the type of recipe you use. I've had these in my 'favorites' for a while & just made them tonight. They were delicious!! I can only imagine what the extras I left out would make them taste like. Every year I have a tradition of hosting a dinner where every dish is made using Meyer lemons. And every year it is harder and harder to come up with creative ideas for recipes but I am so excited to find your Meyer Lemon Limoncello Cupcakes recipe because I was running out of creative ideas. Thank you, thank you, thank you. I know this will be a big hit because we have a lot of cupcake lovers.